Remember When Titans and Ravens Rivalry Mattered? The 2-6 Titans come off their bye week and travel to Baltimore to take on the 5-4 Ravens. The Ravens are coming off a bad loss in the AFC North to the Pittsburgh Steelers in Week 9. Once upon a time this rivalry used to mean something but those days are long gone. Back in the day, the NFL had a division called the AFC Central. The AFC Central’s modern equivalent is the AFC North. Before the 2002 realignment, the Titans (formerly the Houston Oilers) and Ravens (formerly the Cleveland Browns) played in the Central. When the Titans and Ravens squared off in the Central the rivalry was fierce. Since 1996, the Titans and Ravens have faced each other 20 times including 3 post-season games. The series is tied at 10 wins a piece but any Titans fan can tell you the Ravens own them in the playoffs. The Titans own one playoff victory courtesy of a 20-17 win in Baltimore during the 2003 season on their way to a division loss to the New England Patriots 14-17 in Foxboro. The loss to Pittsburgh dropped the Ravens to the bottom of the AFC North but make no mistake this is a tough team. The Browns might be one game up but the Ravens beat them in Week 3 and also beat Pittsburgh in Week 2. This is a team still in the playoff hunt with a good offense. The defense has struggled due largely to injuries and ineffectiveness in the secondary. The Titans also reside in the bottom of their division but they are only one game ahead of the lowly Jacksonville Jaguars who have one win on the season. The difference between the two divisions is striking. The AFC North team’s are all over .500 while the AFC South features only one team with a winning record courtesy of Andrew Luck and the Indianapolis Colts. The Titans aren’t mathematically eliminated from the playoffs yet but they do not look like a playoff team. They would have to win at least 5 or 6 of their next 8 games to be playoff eligible plus get a ton of help from other teams in the conference. It just doesn’t look good. The Titans are more likely to settle for possibly being a spoiler team and they can start with their old arch nemesis the Ravens. The Titans are 2-3 coming off their bye in the past 5 seasons. 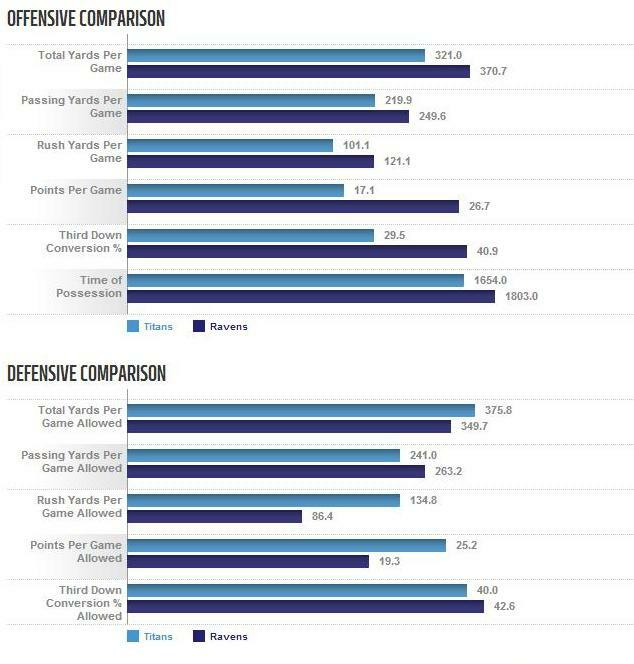 By the numbers, the Ravens are the better team in most all aspects. The Ravens will be without their lockdown cornerback Jimmy Smith and recently cut cornerbacks Chykie Brown and Dominique Franks while promoting Tramain Jacobs from the practice squad to replace Brown. They also activated defensive tackle Terrence Cody from the PUP list cutting tight end Phillip Supernaw to make room. Cody has been recovering from hip surgery. The Titans should be relatively healthy and hopefully will get cornerback Coty Sensabaugh. They did just place tight end Taylor Thompson on injured reserve. Sensabaugh practiced fully on Wednesday. The loss of Sensabaugh in the secondary was particularly rough. A win would certainly give the Titans some momentum entering the make or break portion of their schedule. A loss would put a big damper on the Ravens playoff aspirations. Which team wants this game more? We are soon to find out. Regardless of the outcome, the lack of buzz around this game is telling. Titans’ fans might remember this rivalry but no one on these two teams really do. With the retirement of Ray Lewis, that rivalry passed on. While the Ravens are unlikely to take this game lightly, the matchup is simply no longer a premier one. Long gone are the days when this rivalry really mattered.